If you're like me, there are several techniques that can be scary if you've never done them before. Roasting peppers was one of those techniques. Now that I've done it successfully a few times, I thought you might enjoy a little tutorial. For obvious reasons, this only works on a gas range. 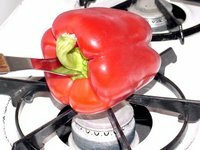 If you have electric, you can simply roast them in the stove, put them in the bowl to steam, and then peel them. But this method seems easier to me, with one less pan to clean and a not-so-warm apartment, especially in the middle of summer. 1. Skewer a large two-tined fork through the stem of the pepper. Be sure to get it in clean and deep the first time. 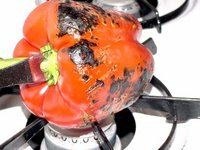 If you have to pull it out and start over you will have a wobbly pepper, which can be dangerous over an open flame. 2. Turn the burner on as high as it will go. Place pepper over the high flame. You can't see it, but there's a hoppin' blue flame coming out of that burner. 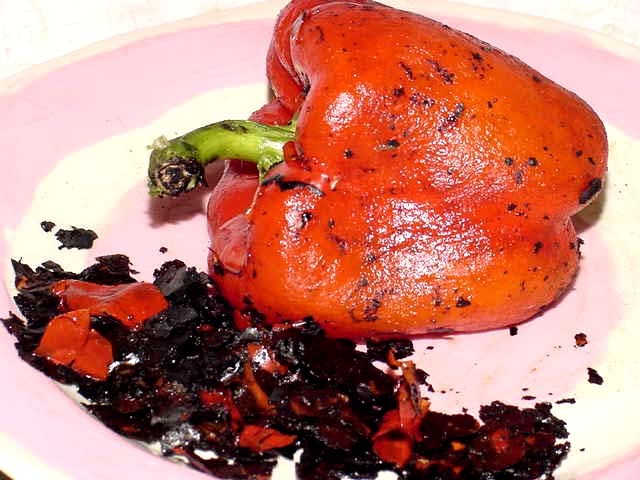 Let the pepper sit over the flame for around ten seconds at a time before repositioning it. It's ok to let the pepper rest on the burner; in fact, it's preferable. The heat from the flame will keep it sterile and the burner will help you keep it steady. 3. 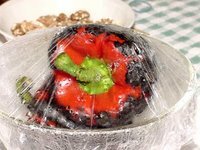 Continue roasting the pepper over the open flame, turning it steadily every ten seconds or so until the whole thing is well charred all over. Any parts that don't get blackened won't peel well, and that's the main objective here. Don't worry too much about the top of the pepper--it's hard to reach without burning yourself or the fork and it's the part that generally gets removed with the seeds. Repeat for each pepper you want to roast. I roasted two peppers here. 4. 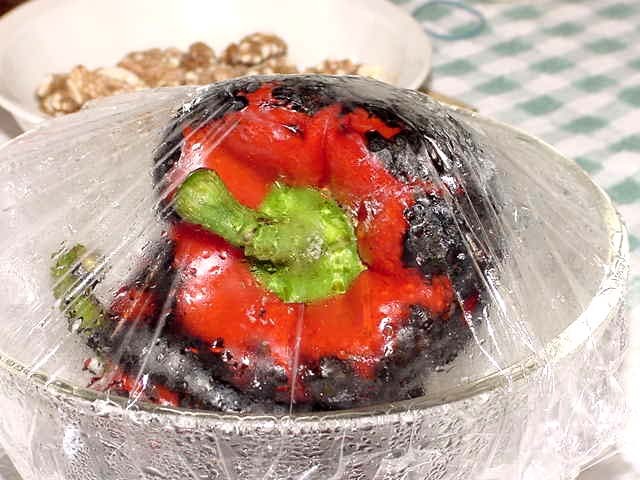 Once the peppers are roasted, place them in a glass bowl and cover tightly with plastic wrap. Let them sit for around 15 minutes. 5. 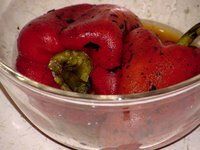 Remove peppers and peel off the skin. Don't rinse them--you want some of those blackened bits to stay on the pepper--that's what gives them their flavor. Once they're peeled, if they're not cooked quite as much as I want, I put them in the microwave for a minute or two, cover them back up, and let them steam for another 5 minutes or so. 6. And there you have it. Simply remove the seeds and you're ready to go. And why was I roasting peppers, you ask? Well, I'll tell you . 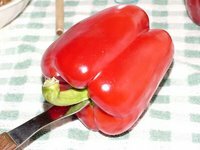 . .
what is the best way to peel, them after they are roasted, i have tried different ways. what do you think is the easiest. I usually just rub the peel off with my thumbs, Nicole. I kind of hold the pepper in the palms of my hands and start rubbing sideways while I rotate the pepper. The blackened bits stick to my hands, so I keep the cold water running on low so I can rinse them every so often. i heard a paper towel is the best way, all the black bits end up on the towel, i have tried it and works great, but one should wait about 10 mins after roasting, for best results. I'll have to try it with a paper towel. Thanks! I find pinching at the skin works well.